Eldorado Canyon is a small but deep gash between Eldorado Mountain to the south, and South Boulder Peak to the north. Eldorado Canyon is a wonder of natural beauty, but it is most famous for its literally hundreds of world famous rock climbing routes. This page is part of an ongoing effort by members of SummitPost to display information on climbing areas of the Front Range that offer excellent recreation year round, even while the other higher peaks are buried deep beneath a harsh winter snowpack. Though small, Eldorado Canyon (Eldo), is very intimidating when one gazes up at its steep sandstone walls from the bottom of the canyon. Flocks of climbers come from across the country and the world to climb its storied walls. Climbing history has been made here repeatedly as climbing pioneers have climbed incredible routes and developed cutting edge climbing innovations. Eldo is incredibly popular year round regardless of the day of the week, and it is not uncommon to see long lines to climb the most popular routes on any given summer day. This is due to the park's incredibly easy access located only 15 minutes from downtown Boulder. Many of the climbers or hikers seen in the park are college students from the nearby university in Boulder who come here for a break from their studies. However, there is plenty of climbing to go around. The Eldorado Canyon websiteon the Colorado State Parks network says that there are more than 500 established routes throughout the park, and there is likely over 1,000. This is truly amazing for a canyon this small, indeed the entire park covers an area of only a half square mile. Because the entirety of Eldorado Canyon is contained within the Colorado State Parks system, word about its scenic beauty has gotten around. Rock climbing is only one part of Eldo's story. This park is popular with families who come here to hike along South Boulder Creek and gaze up at the rock climbers perched precariously on the walls above. There is also a picnic area along the river and hiking trails for all abilities. Finally, in the summer, mountain bikers can be spotted on trails throughout the park. If you are coming from Denver, head north on I-25 to US 36, then take the CO Hwy 170 exit. Follow this as it curves around a shopping complex, and go past CO Hwy 93 to the town of Eldorado Springs and to the state park. You can also go west on I-70 and exit at Golden. Stay on 6th Avenue, which will turn in to CO Hwy 93. From here you can take Eldorado Springs Drive which will lead to Eldorado Springs. Getting here from Boulder is much shorter. Take CO Hwy 93 (Broadway) South until you get to the first stop light after leaving Boulder. This is Eldorado Springs Drive. Take this west until you hit the small town of Eldorado Springs. The park entrance is at the end of the dirt road just beyond the town past the hot springs. 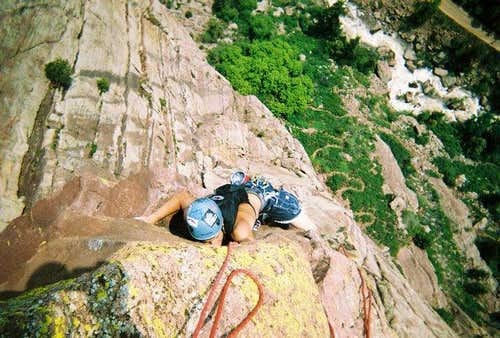 Eldorado Canyon is truly one of this countries most well known trad climbing areas. The rocks are comprised of banded sandstone conglomerate layers that were shed from the Ancestral Rockies. They almost look like large strips of bacon laid on the side of the cliff faces. Some walls reach up to 700 feet in height, and entice climbers with hundreds of routes up their beautiful faces. The texture and consistency of the rock feels very similar to a well worn granite rather than the soft sandstone that one would expect. The largest cliff is the Redgarden Wall. It has several summits and an incredible collection of classic climbs. Historically, Layton Kor, along with climbers such as Pat Ament and Larry Dalke, put up many of the 'classics' in the 60's. During the 1970's, climbers such as Steve Wunsch, Roger Briggs, Jim Erickson, and Duncan Ferguson put up many free ascents and amazing lines. 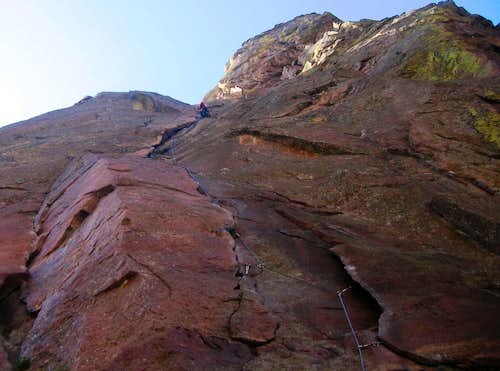 Like every classic area, the stone in Eldorado Canyon is unique and has to be climbed in order to get used to. It is primarily a traditional area, however there are not very many splitter or pure cracks. Much of the climbing zigs back and forth and includes a large amount of face climbing as well. Route finding and placing gear can be issues, so make sure you are more than comfortable with the grade that you are leading if you do not climb often here. Individual pitches will often require delicate face climbing and some kind of traverse before the line continues upward once again. There is a fair amount of old fixed gear in Eldo, but be careful when using this and know that it has been there a long time. Sometimes it is really nice, and on routes such as the The Yellow Spur and the West Buttress of the Bastille (both 5.9) the fixed gear offers protection that would otherwise be few and far between. However, old pitons on routes like the The Naked Edge (5.11) are not going to hold much of any falls. The main message here is that cracks usually run out and are not continuous, so have an open mind and be creative when climbing. You need not look any further than a few hundred feet into the canyon to see climbers and the endless trad lines that await. While trad dominates the canyon, there are significant amounts of difficult sport lines and large amounts of boulder problems that draw people from almost every discipline of climbing. The most popular and most developed areas to climb are the Bastille Wall, the Redgarden Wall, and the Wind tower, all of which are only a 5-10 minute walk from the first parking area. Other areas offer amazing climbing as well but have a slightly longer approach. These climbs can be nice as they are less crowded and you do not have the large amount of tourists watching you climb and waiting with a camera hoping to catch an amazing fall. There are many beginner routes that will help to get you acquainted with the rock and the canyon. Some easier classics include the Wind Ridge and Calypso (both 5.6) on Wind Tower. Moving into the 5.7-5.8 range, Rupers on Redgarden Wall and The Bastille Crack top the list. Another mega-classic is The Yellow Spur (5.9) on Redgarden Wall and is considered by some to be the best route in the Canyon for its grade. Some other awesome routes at the 5.9 range include the West Buttress and Hair City (Bastille), Anthill Direct and The Green Spur(Redgarden Wall), and The Unsaid (The West Ridge). Classic climbs in the 5.10 range seem to be a little less common. Some popular lines are Rosy Crucifixion (10a) and Outer Space (10c).Over the Hill (10b), Super Slab, Grandmother's Challenge, and Tagger (all 10c) are also great. At the 5.11 grade, there are world-renowned classics like the The Naked Edge, Vertigo (11b), and the Northwest Corner of the Bastille (11a). 5.12 climbs become quite scary and can be difficult to protect. Routes in this grade include Scary Canary (12b) and Your Mother (12d). Moving to the 5.13 range, there are not too may routes, due to bolt restrictions. Some classics though like the Desdichado and Rainbow Wall do exist. Anyone climbing these routes are worthy of winning the "worlds best climber award". There is even a 5.14 trad line established called Iron Monkey. As far as specific walls go, the Redgarden Wall definitely has the longest routes for multi-pitch enthusiasts. The Bastille is a 350 foot high vertical wall directly next to the road and is extremely popular. This wall has a large amount of great routes and can become extremely crowded, especially on the weekend. If you wish to get on some of the more popular routes on this wall, I suggest going very early or during the week when there are fewer people. The Wind Tower also has a short approach and has many beginner climbs, as well as some 5.10 routes. The West Ridge/Rincon has several one pitch routes of all grades that are fairly continuous cracks and corner/dihedral climbing. Areas such as Cadillac Crag, Shirt Tail Peak, and the Peanuts Walls are supposed to have excellent climbing, but also have longer approaches. Below is a table with some of the more classic routes at Eldorado Canyon, ordered by difficulty. This table is by no means a complete list but gives people new to this area a good idea what routes to do. All the routes listed have at least 2.5 stars. There are literally over 1,000 routes in this area some of which border adventure climbing. Links below take you to the corresponding SP page if there is one, otherwise links go to Mountain Project. Bastille 50 Once you enter Eldorado Canyon State Park, you will hopefully find parking within 200 yards on the right side of the road. Park and walk uphill along the road for a couple minutes to the obvious bridge across South Boulder Creek. Look up and left. This is The Bastille. The N face is accessed right from the road while the W face is accessed off a 3rd class trail just around the corner and up the steep slope. Wind Tower 50 Enter the state park and drive 200 yards to a parking area along the right side of the road. Walk up the road a couple minutes to the bridge crossing South Boulder Creek and Wind Tower is straight across the bridge. There is a steep trail heading north up the gully that you can take to approach the routes on the SW side of the tower. Redgarden Wall 280 Enter the state park and drive 200 yards to a parking area along the right side of the road. Walk up the road a couple minutes to the bridge crossing South Boulder Creek and cross it. If you are climbing on the east side of the wall, hike up the steep trail up the gully directly across the bridge as per Wind Tower. If climbing further west, follow the flat pathway along the creek and cross the concrete pad and continue up the trail. When reaching a fork, continue right to reach the base of the west side of the wall. The West Ridge 230 The West Ridge is an amazing, diagonal cliff band, far wider than tall, with an enormous variety of climbing on SW-facing Fountain Formation sandstone. You can approach the lower part of the ridge by parking at the Milton Boulder, wade the stream or boulder hop (Aug-May) to the base of the ridge and ascend. 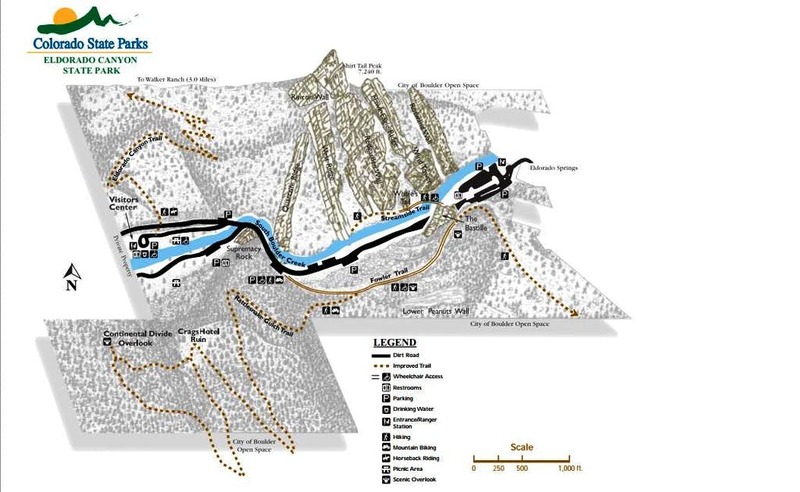 You can approach the lower part of the ridge by parking at the east end of the park, cross the bridge, hike on the trail paralleling the creek, and traverse the slippery 3rd class ramp around to the base of the West Ridge. Rincon 50 Take the Rincon Cutoff Trail, which branches off of the Eldorado Trail at the west end of the canyon. This trail cuts across a talus field near the base of the wall and deposits you around the Center Route. Shirttail Peak is an obscure shoulder on the southern slopes of South Boulder Peak. 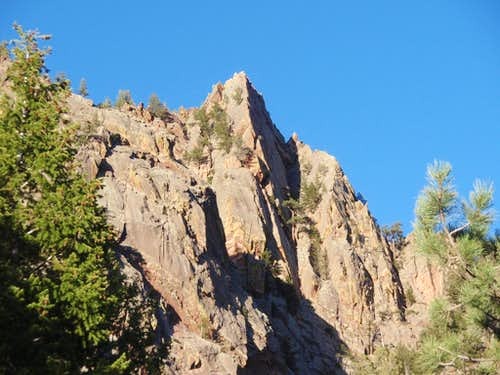 It is in many ways considered to be the summit of Eldorado Canyon and several of the climbing routes on the north side of the canyon top out on the summit of the mountain. Shirttail Peak is the culmination of the famous Redgarden Wall and there are no trails that lead to the summit. The only way it is usually climbed is through the myriad of technical routes in the canyon. There are some non-technical walk up routes to the summit, but these are often used as descents from the technical climbs instead of actual ascent routes. There is an entry fee since this is a state park. The fee is per vehicle ($8) or walk-in for $3. You WILL be ticketed if you park in undesignated spots outside of the park! Annual State Park passes cost $75 for the first vehicle and $25 for additional vehicles. No camping is allowed in the canyon at any time! Eldorado Springs is home to the Eldorado Springs Pool which is heated to temperatures over 100 degrees by water from natural hot springs. It's open between Memorial Day and Labor Day seven day a week from 10-6. The cost of entry is $9 for adults and $6 for kids and seniors. This is a great way to end a hard day of climbing and provides a fun, relaxing way to talk about climbing even more!